A portable bench scale gives you the flexibility and versatility you need to be able to complete your company’s objectives in terms of the weighing of products in a multi-faceted, fast paced environment. If you currently have to walk to the other end of the building to get your postage weighed, or you have to constantly bring small, heavy boxes to a stationary scale, then chances are you are wasting a lot of time simply transporting items during the day. The most advantageous purchase you can make is one that will enable you to squeeze some extra productive time out of your workday. Invest in a high quality, portable bench scale and see how much it will do for you. Bench scales can be found for industrial utilization, thus they are extremely hardy. Additionally, they are often small enough (6′ x 5′ to 12′ x 16′), to accommodate many business needs, from postage, to factory, to laboratory applications. They can also be configured with a number of cutting edge software protocols that will enable them to speak to your PC, whether you want it to load data directly into an Access file, or a spreadsheet. This gives you the added advantage of being able to record and manage your data accurately and effectively. Depending on your business context, you will need to pick a scale with the right set of features. For example, if you are involved in the daily business of formulating medicine, whether at a pharmacy or a laboratory, then the accuracy of the scale is of utmost importance. In that case, you’ll want to make sure that you pick an ultra-precision bench scale with Surface Acoustic Wave (SAW) technology. This technology can detect tiny fractions of weight differences because it is very sensitive. The same need for accuracy is warranted if you are dealing with gold / jewelry, coinage, caustic materials, explosive materials, and others. It will also be important in these types applications that the bench scale you get is digital and is able to self-calibrate. You can get model with a menu screen for easy calibration and tare functions as well. That way you don’t have to constantly service the unit to be sure that the readings are correct or stop to make net weight calculations as you go along. If however, you’re thinking of purchasing a bench scale for postage or any other product where the industry’s standard accuracy reading (0.002lbs) is fine, then all you need to make sure is that your bench scale is well- built to last. What this implies is that it should have a stainless steel pan (the surface on which you place items), have a die cast or welded aluminum frame, and click switches. In terms of versatility, bench scales are small enough to transport wherever you need it to. Load it on your cart and take it to your boxes, instead of the other way around. Keep it in the warehouse section of your business until you finish weighing your packages, then take it inside to the office to weigh your outgoing mail. 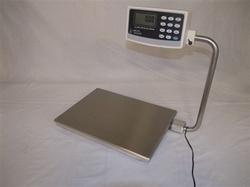 The portability of bench scales is especially helpful if you need to purchase one of the high accuracy models, which can be pricey. Invest only in the amount of scales you need, and move it/them around until your business grows enough to be able to afford more units. Whatever your business needs, whether a large or small outfit, a portable, industrial quality bench scale can be a workhorse for you. Contact ArlynScales for a selection of models and the appropriate attending software for your specific industry.